The days of Endlessly Scrubbing Your Carpet, Floor Mats and Cloth Upholstery with Shampoo are Over. SKU: VU. Category: Soaps & Cleaners. 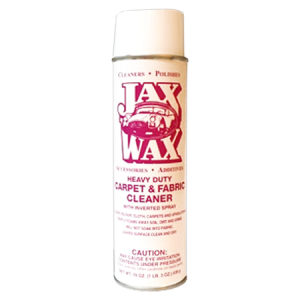 Jax Wax Upholstery and Carpet Cleaner Packs an Awesome Punch to Effortlessly Clean Dirty, Soiled Areas Easily. 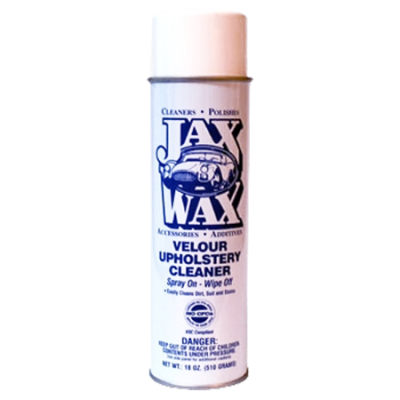 Jax Wax Upholstery and Carpet Cleaner is especially formulated to clean all types of fabrics and upholstery. Before the days of carpet extractor cleaners, the first thing that a car dealer ususally had to do when talking a car on a trade was to buy new floor mats. Not so with this product – it will knock the stains out of the dirtiest, most grimy and stained floor mats saving an uneeded expense. 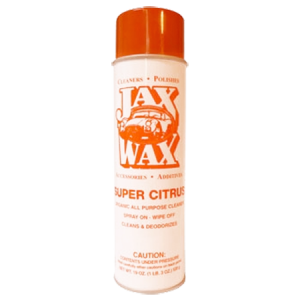 Jax Wax Upholstery and Carpet Cleaner is Packaged in an “Upside Down” Aerosol Can to make it Easy to Apply and For Easy Access to Those Hard to Reach Areas. Jax Wax Upholstery and Carpet Cleaner is also Perfect for Around the House, for example when Kids or Pets have an “accident” on the carpet – it will even clean Grass Stains from White Sneakers! 1. ALWAYS test an inconspicous area first for color-fastness. 2. Spray product onto area to be cleaned. The product will foam much like shaving cream – you will see dirt lift as soon as it's applied. 3. Let it set for 30 seconds or so – agitate with a brush if area is particularly soiled. 5. Let dry and vacuum – done! 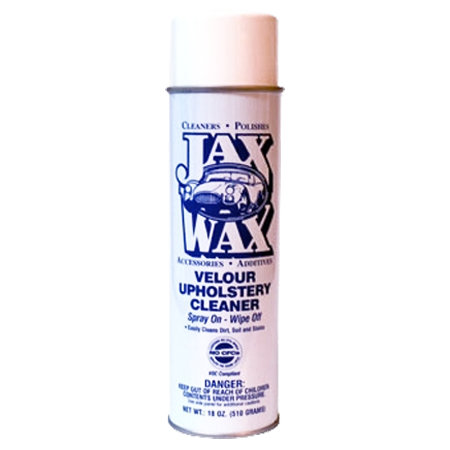 Be the first to review “Jax Wax Velour Upholstery and Carpet Cleaner” Click here to cancel reply.